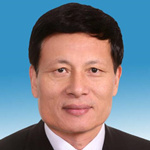 Born in Aug. 1954, Xie Fuzhan is a native of Tianmen in Hubei Province. With a master’s degree in engineering, he is a research fellow and doctoral supervisor enjoying a special government stipend from the State Council. He started his career in March 1973 and joined the Communist Party of China in November 1974. In 1991 and 2001, he won the Sun Yefang Economic Science Award, and in 1996, he won the National Science and Technology Progress Award (second class). Xie’s areas of academic interest include macroeconomic policy, public policy and regional development policy. He chaired and co-chaired such major projects as the Follow-Up Study of the Financial Crisis in East Asia, Research on SOE Reform and Development Policy, the Study of Economic Globalization and the Role of the Government, the Study of Financial Risks and Security, Research on Improving the Socialist Market Economic System, the Study of Major Issues Concerning China’s Mid-Term and Long-Term Development and Study of Real Estate Taxation Reform.